For those unfamiliar, the prospect of starting therapy can be daunting. It is often a realm of thought, emotion, and vulnerability that many of us work so diligently to ignore. You may have also have been in therapy before yet struggled to see the results, which can make the prospect of re-engaging somewhat scary. While understandable, there are a few factors which can help make your therapy experience positive and beneficial. Pick a therapist who is right for you. There are many different kinds of therapists who employ a multitude of approaches to and techniques in their practice. Those who have a website often draft a biography that mentions these elements. Some therapists also have a particular specialty which may be important to you. Often more important than a specific approach or technique, however, is the connection between therapist and client (or “therapeutic alliance” as it is professionally known). It is often the most significant factor in predicting the efficacy of therapy. Be as honest as possible. There is no mind-reading class in graduate school. Therapists, although skilled at picking up nonverbal cues, ultimately have to rely on what clients disclose. This relates both to your history and to your on-going progress. It can be common for clients to hold back for fear of being judged or offending their therapist. 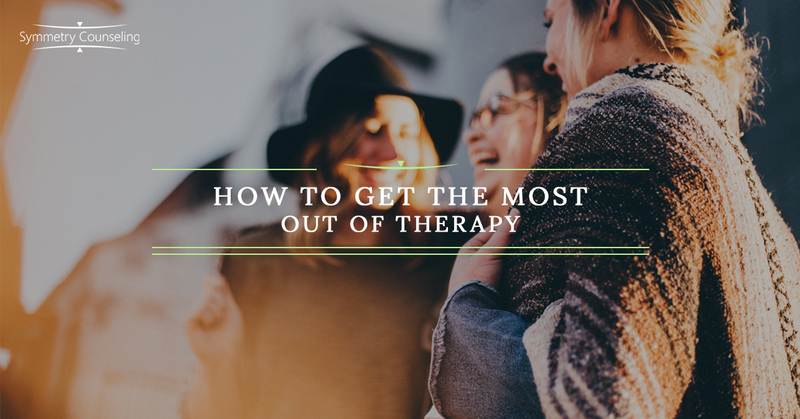 While therapists are still human and not immune from mistakes, an important part of their training and practice involves ways to avoid these pitfalls. Keep in mind—unless your consent is given, a therapist cannot reveal anything that is said during a session or your status as a client. There are a few exceptions to this rule, primarily related to your safety and the safety of others, which your therapist can review with you. Make appointments a priority. Life is busy and it can be tempting to view therapy as a luxury. However, for therapy to be most effective and for you to get the most benefit, consistency is key. A major component of therapy is replacing self-defeating behavior with more adaptive habits. Ask anyone who has tried to quit smoking, improve a relationship, or eat healthier—changing habits can be difficult and requires persistent effort. Most in therapy attend weekly, hour-long sessions to build trust and accountability. Whatever the issue, if it brought you into therapy, it deserves the consistent attention regular work with a therapist provides. Work on issues in between sessions. Some therapists may directly ask you to work on “homework” in between sessions. This can range from reading a recommended book to attending 12 Step meetings to practicing a new way of communicating. Whatever the particular method, it is hugely beneficial to take what is discussed in the therapy room into the outside world. While this may seem self-evident, it is common to assume that talking to someone for an hour once a week is the totality of the process. However, unless the work actually leaves the room with you, it can hardly be an effective use of time. Consult with other supports. For some, it may be beneficial to expand the support team to include a psychiatrist, physician, 12 Step sponsor, or spiritual advisor. A therapist’s office can be a powerful arena for personal change, yet serves a different role than those mentioned. While not applicable to everyone, factors such as medication, sobriety, or prayer can enhance therapy’s benefit. Therapy can be a useful tool on the journey to your most meaningful life. Contact Symmetry Counseling today to start your journey!